Rosemary oil is nothing short of a miracle—in fact, the whole plant is pretty remarkable. Here, an herbalist reviews what rosemary oil is good for and exactly how to use it. Rosemary's use in medicine and religious ritual dates back to antiquity, and we have evidence that the plant was highly valued in Egypt, Greece, and Rome. Its reputation included benefits for the whole body, including for digestion, circulation, pain relief, and beautification of the skin and hair. Scientific studies have shown that rosemary has promise for a wide variety of health conditions including cancer prevention and treatment, respiratory health, and gut health. The essential oil has significant antimicrobial and antioxidant properties. Rosemary has also been shown to affect mood, memory, and cognition. Its anti-anxiety and antidepressant-like effects have been demonstrated in both humans and mice, and even small amounts of dried rosemary were shown to improve cognition in the elderly in one placebo-controlled study. Rosemary: Should you use the whole plant or essential oil? Essential oils are like the gateway drug to herbal medicine. They come in cute little bottles that are easy to store and fun to collect. Their fragrances delight the senses, and they work fast when used properly. It's easy to see why essential oils are so popular. But remember, essential oils are just one of the many types of beneficial compounds produced by plants. Nature doesn't produce them in concentrated form, and healing traditions from around the world mostly relied on whole plants subjected to only minimal processing in the form of cooking, extracting in liquid, or drying. Many of these techniques extract the essential oils of a plant along with other beneficial compounds. When only the concentrated rosemary essential oil will do, use it. Otherwise, it's much more sustainable to use the whole plant. Besides, rosemary is easy to grow—and there's nothing more potent or satisfying than making remedies with herbs you've grown yourself! Rosemary's antioxidant and antibacterial properties make it especially well-suited for skin care. Whole-plant extract has been shown not only to reduce the inflammation associated with acne but to directly fight the bacterium that causes acne outbreaks. In addition to the benefits of applying rosemary topically to acne-prone skin, consuming rosemary by mouth has been shown to afford the skin some protection from UV damage (still—don't skip your mineral sunscreen!). If you have acne-prone skin, a simple toner made from witch hazel, rosewater, and rosemary can soothe inflammation and stop breakouts. Add all ingredients to a small saucepan and bring to a simmer. As soon as small bubbles start to form, turn the heat off and cover the pot with a lid. Let steep until cool to the touch. Strain the finished infusion and store in a clean and labeled glass jar. Use within 2 months. To apply: Pat into clean skin twice per day, or apply to clean skin with a spritzer bottle. Rosemary oil for hair and scalp. Both Western herbal traditions and modern scientific evidence agree that rosemary is a valuable herb for people who want full, lustrous hair and a healthy scalp. A 2015 randomized comparative trial found that rosemary essential oil was just as effective as minoxidil (brand name Rogaine) for reversing hair loss caused by androgens, which is the most common cause of lasting hair loss for healthy adult men and women. 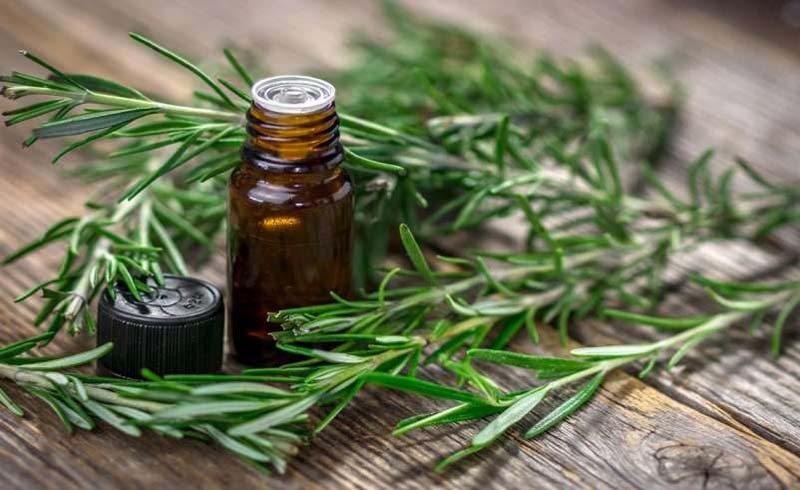 To attempt to get a similar benefit from rosemary essential oil that you'd get from minoxidil, I'd recommend replicating the concentration used for the 2015 study by making a 2 percent dilution of rosemary essential oil in a base of jojoba oil or aloe vera gel. Apply the mixture to your scalp every night, and stick with this regimen for at least six months—that's how long it took for study participants to achieve results. Of course, talk to your doctor before trying anything different from your routine. This is a case where using just the essential oil, not the whole plant, makes good sense. On the flip side, not everybody agrees that rosemary oil is good for hair loss. Integrative dermatologist Cybele Fishman, M.D., said while she has not found it effective for hair loss, "it is an impressive antifungal." She also added that she takes Kaprex, a natural anti-inflammatory, for sore joints and muscles. Rosemary extract is one of the main active ingredients. Combine rosemary essential oil and the jojoba oil or aloe vera in a small jar or bottle. Shake to combine, and label the bottle clearly. To apply: Massage 1 to 2 teaspoons of the mixture into the scalp in the evening. Leave on at least 8 hours before shampooing. If using aloe vera gel, store in the fridge and use within 1 week. If you don't need an intensive treatment for male or female pattern baldness and you're just looking for a time-tested way to refresh your hair and scalp, the following recipe is perfect. If your hair is oily or prone to product buildup, you can use this rinse as often as twice per week. If your hair is very dry, you might want to use it only once per month. Experiment with it to find the frequency that works for you. Adapted from The Simple Guide to Natural Health. Once the vinegar is finished steeping, remove the fresh rosemary sprigs and make a decoction of dried rosemary to add to the vinegar. For the decoction, add 2 cups water and ¼ cup dried rosemary leaves to a small saucepan and bring to a boil. Turn the heat down to a simmer and cook until the volume is reduced by half. Remove from the heat and allow the mixture to cool before straining. Add the strained rosemary decoction to the jar of infused vinegar. Label the jar, including the date and ingredients. Store at room temperature away from bright light up to 1 year, but use within 3 months for best results. When you're ready to use the treatment, measure out ¼ cup into a plastic container that's safe to take into the shower or bath. Before shampooing your hair, pour the treatment generously over your scalp and roots. Massage it into your hair thoroughly, then shampoo and condition as normal.